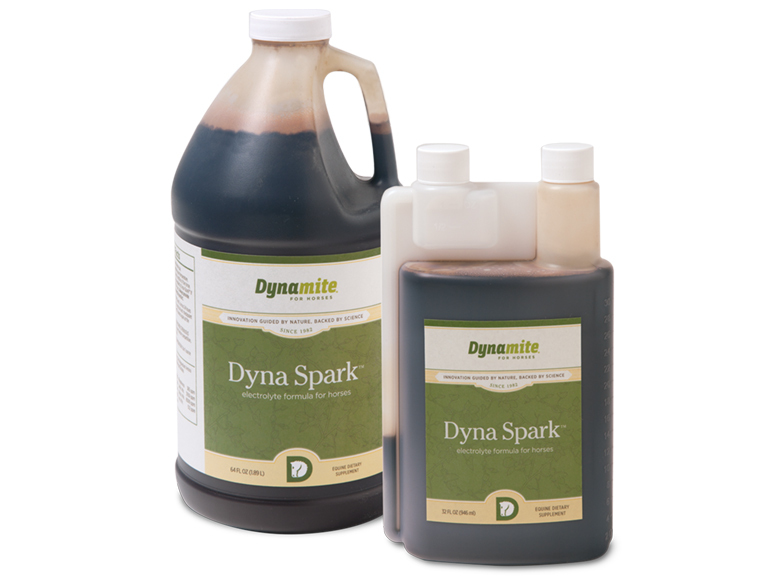 Dyna Spark is a must for any horse that is being challenged physically. It provides a unique electrolyte balance as well as addresses the subtle physiological requirements of a working horse - be it training, competing, foaling, or even recovering from injury. 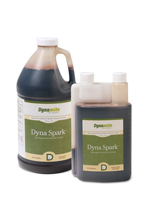 Dyna Spark is free of refined sugar and contains nothing artificial. Most commercial electrolyte formulas consist of more than 50% refined and processed salt (sodium chloride). Salt is then augmented with 10-20% inorganic (unusable) potassium and minerals. Others add bicarbonate of soda in an attempt to neutralize the acid which is the by-product of exercise. Many electrolytes contain dyes and artificial flavorings, which are not conducive to keeping a clean liver. Sugar is another additive commonly found in electrolyte formulas. The main difference between Dyna Spark and other electrolyte formulas is in the science behind it. Most electrolyte formulas are developed by scraping sweat from the animal and analyzing the contents therein. To some this sounds like a logical process when in reality it is counterproductive. Think of it this way—it is like taking the exhaust from your car, analyzing it, and then putting a concoction of the exhaust elements back into the gas tank to run the car! Auto exhaust is a by-product of combustion, just as sweat is a physiological by-product. In both, the systems transform the original ingredients through heat and chemical reactions to create entirely different end products. Dyna Spark addresses electrolytes from a different, natural perspective by supporting the physiology of exercise and the metabolic cycles that lead to energy production, sweat, nerve impulses, and muscle function.